The Birmingham FA Grassroots Football Awards is a night full of celebration, inspiration and recognition for its community members. The main purpose of the event is to celebrate and recognise the work that the volunteer workforce does within grassroots/community football by providing attendees with a night to reflect on all the hard work that has been put in throughout the year. We were asked by Birmingham County Football Association to help with the organisation of their annual grassroots football awards. The brief was simple – bigger and better than last year! Our objectives were to add a bit of sparkle to the event and increase numbers from the previous year’s events. With only a small budget set, we had the tricky job of delivering a rewarding evening that had a luxury/grand feel but also being cost effective. We were responsible for venue sourcing and management of all correspondence with the venue. 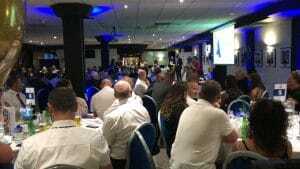 We were committed to finding a venue that ties in with the football theme in which the event was held at Birmingham City Football Club which proved to be a great access location for all attendees. We ensured a two-course dinner was provided and all dietary requirements were met and managed on the evening. We also arranged a pre-drinks reception that allowed guests to network beforehand. We were responsible for the room décor and matched the events brand theme which was Blue and Gold stars, we provided powerful LED wireless up-lighters to add ambient mood lighting to the venue as well as football favours on the tables and start balloons and table confetti. There was also a red carpet to greet guests when they arrived to lead them into the venue and give them a VIP feel. We supplied an AV Technician to manage all video and sound for the main awards presentation and the plasma screens situated around the room. The evening was hosted by BBC’s Jenny Wilkes and had guest ex pro footballers; Terry Angus, Jason Lee, Michael Johnson, Stuart Atwell, John Richards, John Gayle, Steve Antrobus and David Busst. The event was streamed on Facebook live and we had a photographer and videographer capturing the highlights of the evening.